Image: The seal of HBU with John 14:6 as the motto. I got back late Saturday from attending the Erasmus Conference at Houston Baptist University. I'll be doing several posts this week from the trip and conference. Houston is a great city to visit. It is very large and very spread out (in the vein perhaps of everything being bigger in Texas). As one Texan friend put it, "Houston is like a cancer that just keeps getting bigger!" Houston is ethnically diverse, with Anglos, Latinos, African-Americans, Arabs, and Asians [there is a sprawling "China Town" around Bellaire Blvd.]. I found the people to be warm and friendly. I spent most of my time on the attractive campus of HBU, a school with Southern Baptist roots which seems to be aiming for a more broad evangelical identity. Image: Outside the chapel and fine arts building. Image: The "Morris Columns" on the lawn, in front of the Hinton Center. Image: I had to check out the HBU baseball diamond. 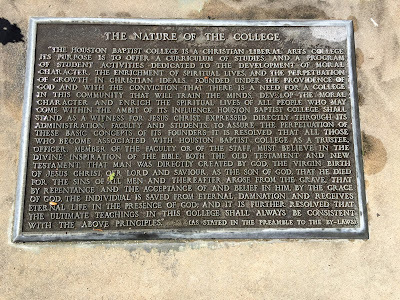 Image: Plaque on "The Nature of the College"
I found the above plaque interesting. The founders of HBU obviously wanted to insure that the school remain committed to traditional, orthodox Christianity. This reminded me of James Tunstead Burtchael's book The Dying of the Light: The Disengagement of Colleges & Universities from Their Christian Churches (Eerdmans, 1998), which traces the tendency of schools which begin with a strong Christian identity and mission to drift, compromise, and become secular. 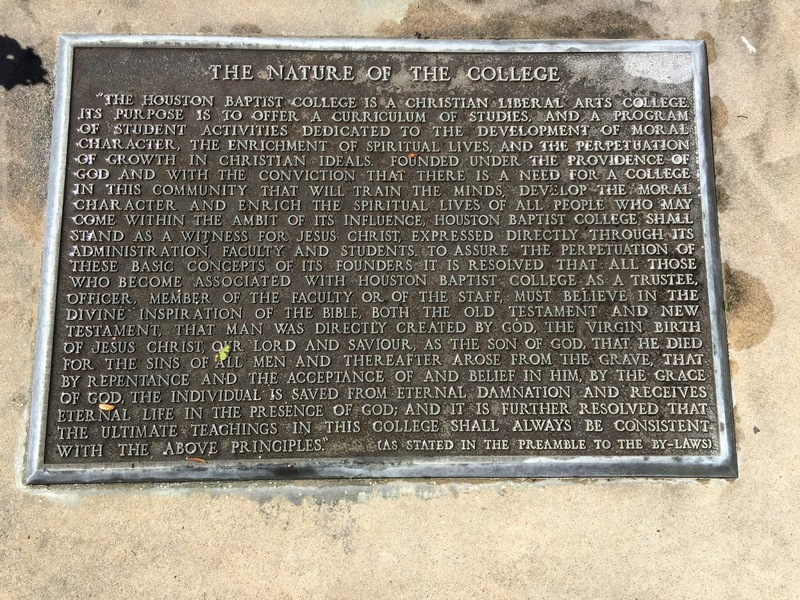 The plaque notes the desire that the school "stand as witness for Jesus Christ" and to that end resolves that the trustees, officers, faculty and staff "must believe in the divine inspiration of the Bible, both the Old Testament and the New Testament, that man was directly created by God, the virgin birth of Jesus Christ our Lord and Savior, as the Son of God, that he died for the sins of all men and thereafter arose from the grave, that by repentance and the acceptance of and belief in him, by the grace of God, the individual is saved from eternal damnation and receives eternal life in the presence of God; and it is further resolved that the ultimate teachings in this college shall always be consistent with the above principles." It is noteworthy that this statement is influenced by the "fundamentals" approach to defending orthodoxy: biblical inspiration, special creation of man (denying evolution), virgin birth of Jesus, historical resurrection, etc. It seems also to present a universal view of atonement: "he died for the sins of all men" assuming the "all men" does not mean all types of elect men (Jews and Gentiles). One thing it is not--and this is typical for Southern Baptists--and that is confessional (i.e., it appeals to these fundamentals but not to a historic ecclesiastical confession). I don't know enough about HBU to evaluate where it stands on these principles after more than 50 years, but at the least it hosted a good theology conference.